The Polish Air Museum (Muzeum Lotnictwa Polskiego) may not be one museum that every tourist wants to go to, but if you like aviation history and old airplanes, it's worth a visit. 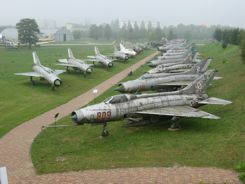 It's in a suburb of Krakow at a historic airfield about 7 km (4.3 miles) east of the Old Town. ...one of the oldest military airfields in Europe by the way. After that the expanding city of Krakow encroached on the field. The military moved out and finally so did commercial aviation. Activity at the airfield stopped in 1963. The outdoor lineup we call "MiG Alley" is impressive even if the aircraft have seen better days. Most are not in great condition, but you won't see things like this at home. "I've never seen that before... only in pictures,"
"I never thought I'd see that!" What caused the excitement? Well, you might have to be as much into airplanes as we are to get that excited. There were interesting planes to see. See the full story and more photos at our sister site... Antique Airplanes. You can take a taxi or a tram. 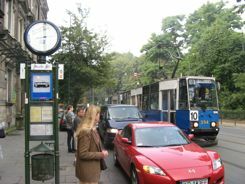 We took tram Number 4 out and Number 10 back to the center of town. ...but, as we found out the hard way, this is a couple of stops too far. Get off when you see the Polish Air Museum Logo. And it's behind some apartments. It is open from 9:00 am - 5:00 pm Tuesdays through Fridays. Saturdays and Sundays the hours are 10:00 am - 4:00 pm.